NEW in opened box. All pieces are originally sealed. K'NEX Super Mario 3D Land Bowser's Castle Building Set- RARE FIND! Each lot includes 130 K'nex pieces (10 of each color & type of connector) exactly as shown. In clean, very good used condition! These mixed lots are great for replacing missing pieces or as a sampler set with a little of each type of connector. Nice condition and complete. was only used for display from a adult collector. K'NEX Lincoln Logs complete NIB 'Wrangler's Ranch'. Box dented but new; all pieces in sealed plastic. 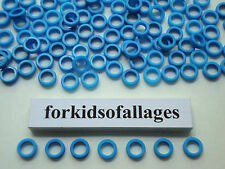 Each lot includes 500 K'nex standard blue spacer rings. 60 ORANGE 2 POSITION LADDER END CONNECTORS - Excellent clean condition. Each K'nex building toy lot includes a mix of 25 standard K'nex flexible rods in neon/ fluorescentcolors (9 bright orange, 8 red and 8 darker orange pieces). In clean, very good used condition! Each lot includes 25 sets of Ball & Joint Sockets (50 pieces total). These are the standard K'nex size. Each lot includes 8 K'nex gears as shown. Brand new Bowser figure in sealed pack. This item is rare, hard to find. In clean, very good used condition! These are the the 5 1/8" size (from connector end to end). Each lot includes 10 K'nex gears as shown. Nintendo MarioKart Wii MARIO AND BOWSER ICE RACE K'NEX SET New Sealed in the box. We never removed the toy it is still sealed in the package but the box has a lot of issues dents and damage. Please see the pictures for full condition. Smoke-free home.Shipped with USPS Priority Mail. Can be used in set #50542 Doubleshot Coaster or other sets and custom builds. Micro K'nex pieces (rods, connectors, etc.) aresmaller than the standard K'nex. We have many Micro K'nex and standard size K'nex parts/pieces listed. These are from the Training Tower #63147 but are interchangeable with other sets! See photo gallery for the actual lot you will receive! Each lot includes 1 00 K'nex standard gray end connectors. In clean, very good used condition! Each lot includes 400 K'nex standard purple connectors. In clean, very good used condition! Very Good condition. All complete pieces to build main formula car on the cover of manual. Features moving engine pistons when car is rolled. K'NEX Titanfall Militia Ogre Titan Building Set 69504 - New In Box ! Limited ! The durable plastic pieces stick together securely and can be easily reassembled into other creations. Each order is for one bale of hay. Each lot includes 200 K'nex standard gray / silver spacer rings. You will receive 2 randomly selected sealed bags. 4 large (approx. 4 small (approx. In clean, good used condition! ). MARIO KART Wii K'nex BOWSER VS. FIREBALLS plus MARIO VS. THWOMPS-USED- EXCELLENT CONDITION. HAS MOST OF THE PARTS & ALL OF THE TRACK. ONLY HAVE THE BOWSER VS FIREBALLS BUILDING SET BOX. BOTH HAVE BOTH BOOKS. GREAT WAY TO GET SETS AT GREAT PRICE. PLEASE SEE PHOTOS FOR CONDITION AND TO JUDGE FOR YOURSELF. New ListingKNEX Lot CHAIN LINK 120 LINKS 10 FEET FT SCREAMIN SERPENT Roller Coaster 1 1/4"
KNEX PARTS ONLY. LOT OF CHAIN LINKS. APPROX 120 LINKS - 1 1/4" length. 10 FEET LENGTH. RIPPIN ROCKET COASTER CAR. KNEX PARTS ONLY. THIS CAR GOES WITH THE RED TUBING (NOT MINI CAR). K’NEX K-FORCE Battle Bow Build and Blast Set – 165 Pieces – Ages 8 Engineering. Condition is New. Shipped with USPS Priority Mail. Each lot includes 25 solid dark gray 3 7/16" rods and 25 connectors as shown. These are not the speckled gray "granite" color. These are a much harder to find color in the shape of the standard yellow rods and connectors. Each lot includes 4 K'nex wheels as shown. In clean, very good used condition! The K'NEX Mario Kart Bike Building Set includes 26 assorted classic pieces. K'NEX strengthens hand-eye coordination, fine motor skills, problem-solving skills, and trains a child's imagination! Building with K'NEX puts children on a path of STEAM/STEM subjects (science, technology, engineering, arts & math). 30 PCS WHEN BIKE IS DISMANTLED. BUILDING INSTRUCTION BOOK INCLUDED. OTHERWISE IN GOOD USED CONDITION.